Welcome to “Future Tao: Training Space,” an experimental arena for mind and body training. Central to our program is a reconsideration of Taoist informed ideas with contemporary imagination. How are ancient strivings towards expanded consciousness, energy cultivation and union between man and nature relevant in today’s context? As definitions of nature, reality and the self are rapidly changing in the present times, it is critically important to renew our methods to understand spiritual belonging in the universe. The exhibition hopes to harness the collaborative potential between old and new technologies in search of self-cultivation methods appropriate for today. “Future Tao: Training Space” features three artists working in the capacity of sound, body movement, and computer-generated realities. Each project embodies personal approach to self-cultivation, a pursuit in art and life that is at the core of their ongoing practices. Sheryl Cheung’s ”Inner Soundscapes“ is an experimental sound project that interprets the sounds of Taichi in public parks of Taiwan. Taichi, as a form of Chinese martial arts, stresses on the cultivation of energy within oneself as well as with one’s surroundings. 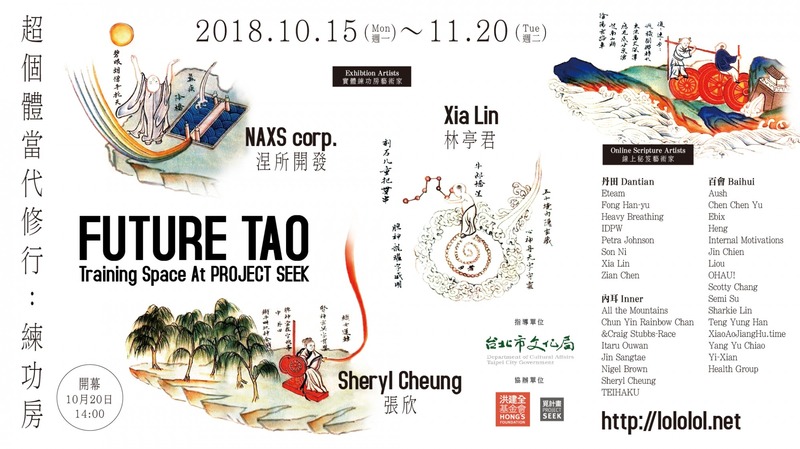 Using field-recordings and biofeedback collected from Taichi practitioners and their surrounding natural life, the project seeks to explore relationships, changes, and the life force of the animated park life. Xia Lin’s ”3C Xing Yi Quan“ is an open source project that invites different community groups to collaboratively develop a new style of martial arts that imitates the body language and characteristics of 3C products, such as laptops, cellphones and selfie sticks. As these products largely make up our technological habitat today, the project aims to reinterpret the Taichi concept of achieving spiritual union with our surroundings. NAXS’s ”XR-XATA-01“ is a virtual reality project that presents a ritualistic experience of faith. A digital ship with VR equipment goes underwater to explore the sensory functions and narrative methods of digital humans. While submerging into the abyss of the Internet, the ship considers the possibility of an evolving consciousness that goes beyond that of the individual. Concurrently, an online inner scripture is also available for browsing at the exhibition. lololol.net is a participating pavilion of the Bangkok Biennial collectively written by 30 artists who contribute their artistic reflections on self-cultivation in contemporary times. Participating artists include eteam, Fong Han-yu, Heavy Breathing, IDPW, Petra Johnson, Son Ni, Xia Lin, Chen Xian, Bruce Bo Ding, Chun Yin Rainbow Chan & Craig Stubbs-Race, Internal Motivations, Itaru Ouwan, Jin Sangtae, Nigel Brown, Sheryl Cheung, Sound of Mountains, AUSH, Ebix, Chen Chen Yu, Jin Chien, Liou,Heng, Scotty Chang, Semi Su, Shark Lin, Teng Yung Han, OHAU!, XiaoAoJiangHu.Time, Yang Yu Chiao, and Yi Xian Health Group.